The Reptile Report - If you’ve ever wondered how you can turn your love of reptiles into life-long involvement that provides not only fulfillment for yourself but also has a deep and lasting impact on the world around you, just read the story of Ryan McVeigh. The “big breeders” of our community are usually considered the super stars, but Ryan shows us there is much, much more to our industry than just that. Find out how he is making a difference and learn how you, too, can create lasting ripples that change the world around you. TRR: Tell us about yourself. Life through school and college was pretty normal, although once out on my own my passion and reptile collection grew exponentially. In college I started using my animals to do presentations at schools. That experience really grew my love for educating people about the animals I loved. In October of 2010 I wanted to share my passion and reach out to more people about the animals I loved, along with giving other people with the same passion a place to share that, so I started the Madison Area Herpetological Society. After a year, we had a great board and group of people, and it grew to be one of the most active, well known, influential, herpetological societies in the country in a very short time. In 2014 we won “Herp Society of the Year” through the Reptile Report from a voting of our peers. That has been another incredible journey and the amount of outreach we’ve been able to do, fully from volunteers, has been incredible. Without the dedicated board members and volunteers, MAHS would never have gotten to where it is today. Four years ago, I met my wife Angel, and her two kids–Zakk, 2 years old at the time, and Naomi, who was 3 weeks old when I met her. She had a similar passion for animals, but had never had the chance to really explore that passion. Together we’ve shared our love for animals and our number of pets has doubled. While my interests were focused on boids and geckos, she loves colubrids and chelonians, so together, we have a little of everything. Then 2 years ago I got the news that we were adding another young herper to the family, and before I knew it, one turned into two, and my twin daughters Lily and Adelise were born. All of my kids love animals. While some people think it’s because they’ve grown up around it, I think it has a lot more to do with the fact that we never told them not to love them, or to fear them. At the beginning of 2015 I began working as the Brand Manager for Zilla, and it has been an incredible ride so far. TRR: Do you keep a lot of cold-blooded pets at home? Other pets? Ryan: I couldn’t see myself without a reptile or amphibian in my home. They’ve been such a huge part of my life and my passion. I don’t think that will ever change. Over the years I’ve kept a little bit of everything, but now am focusing on fewer species and more diversified groups. At one point I had over 250 animals, not including babies, but right now, with a busy work schedule and a large family, I’ve slimmed down to a more manageable and focused collection. We currently have around 45 turtles and tortoises, 60 snakes, about 10 lizards, and 15 amphibians, along with a few invertebrates. My focus has gone to Amazon Tree Boas and Austrailian and South Pacific Pythons (Womas, Blackheads, Olives, Savus), and my wife has focused on turtles and tortoises, western hognose snakes, and more recently boa constrictors. However, we will always have a few miscellaneous animals such as our pair of leachies, a tank of Bird Poop Frogs, and our Argentine Black and White Tegus. Although my life mostly revolves around reptiles, I also have a wonderful dog, Bailey, who has been with me through college and is a big part of my life. TRR: Your business card says, “Central Garden & Pet”. Is that another enterprise or a “parent company” over Zilla? Ryan: Central Garden & Pet is a large company that owns many other smaller companies in both the pet industry, and the garden industry. Some other notable pet brands are Nylabone, Kaytee, Four Paws, BioSpot, Adams, Super Pet, Aqueon, Coralife, and Kent, among many others. I work in the Central Aquatics division, which consists of Aqueon, Coralife, Kent, and Zilla. Our division is located in Franklin, WI, which is also where all of the Aqueon and Zilla habitats are made. My position is the Marketing Brand Manager for Zilla, so I manage the direction, innovation, product development, marketing, and many other aspects of the Zilla brand. TRR: Tell us what Zilla is all about. Ryan: In the past, Zilla has aligned themselves as being a company that focuses on the beginners in the hobby and helping them to get started on the right foot. We have worked to create reasonably priced and complete kits for the entry level reptile enthusiast, and have been very successful at that. The future of Zilla is going to continue to work on making sure that when a new enthusiast goes to the store and picks up their first pet, that our products and kits help them to keep that animal healthy and happy for the entirety of its life. While doing that, we are also looking at developing more products aimed at the intermediate and advanced level keepers. We want people to be able to start their passion and their hobby with Zilla, and allow us to grow with them as their passion does. We are also looking to the future and working to develop new and unique products to rethink how we keep these amazing animals in captivity. You will see more realistic décor, lower profile fixtures that have both heat and UVB, and more energy efficient yet powerful lighting and heating designs. Our goal is to make keeping these animals easier, while providing them a better habitat and life. TRR: When/how did Zilla get its start? Ryan: Zilla came together in 2005. Central Garden and Pet acquired multiple pet companies in the late 1990’s and early 2000’s. Many companies had small reptile offerings, but it was under a variety of brands and spread out. Energy Savers Unlimited (ESU) had the ESU Reptile brand and they specialized in lighting, heating, bedding, and accessories. The brand Four Paws had some bedding and screen covers. The KAYTEE brand manufactured reptile foods and bedding. Finally, All-Glass Aquarium manufactured the glass habitats and furniture. Separately each didn’t have a complete reptile line, so in 2005, the Franklin facility (formerly known as All-Glass Aquarium) became the aquatics and reptile division for Central Garden and Pet. The Zilla brand pulled together all of the reptile products from each division and placed them under one brand and under one roof. This allowed us to build a fuller line that customers could become familiar with, as well as allowing us to work more closely when it came to research and development of products. TRR: Have you always worked in the reptile world? Ryan: I’ve always had a passion for reptiles and always kept them, but other than working at a pet store in college, never worked with them professionally. My fear was that if I worked with the animals I loved so much, that it would become a job, and in turn ruin my passion for them. I thought of being a zoo keeper as a kid, but when I got older thought “If I spend all day cleaning up after animals, will I want to come home and do that with my own?” That steered me away from a career in animals, but for the past 18 years I’ve kept reptiles, bred them, and sold them locally and across the country as a hobby. I’ve always been involved in reptiles in some way, and I can’t see my life without them in it. TRR: Did you follow the traditional route of going to college and getting a degree? If so, what did you study? Do you think this path (with or without a degree) has impacted your current business? Ryan: I did follow the traditional route, but not in this field. While growing up I always loved seeing the houses my grandfather built and was influenced by my uncle who was an engineer. I ended up combining both of those fields and went to the Milwaukee School of Engineering for Architectural Engineering. My focus was Heating/Air Conditioning, Plumbing, and Fire Protection Design. After my first year, I became interested in wastewater treatment, and soil and groundwater remediation, so I decided to do a dual degree master’s program and also get my Master in Environmental Engineering. After college, I worked in Inside Sales for a large HVAC equipment sales company, then as a Project Manager and Building Commissioning Agent for a Green Engineering Firm. While there, I had heard about the job available at Zilla, but didn’t have a marketing background so I didn’t really look into it. As time went by, I was contacted by friends that worked at Central Aquatics and wanted me to come in for an interview, but I pushed that to the side. Eventually I took some time to look into the job and what it was, and decided to come in and talk with them. 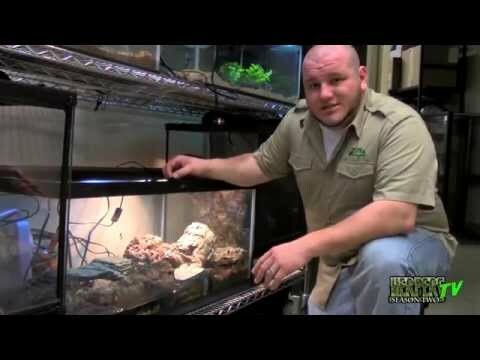 My passion for reptiles, my experience in the hobby, and my knowledge of husbandry was something they were excited about. My background in engineering actually helped since it put me in a great place to help design and develop new products as well as rethinking ways to heat habitats. I began working the first week of 2015, and it was the best choice I’ve ever made. The company is incredible, my coworkers are amazing, and I get to work within the hobby that I love so much, without losing my interest in my own animals at all. In fact, this job has pushed my passion and excitement higher than it’s ever been. TRR: What other reptile endeavors are you involved in? Ryan: As I mentioned before, I am heavily involved in the Madison Area Herpetological Society, and have been acting President for the last 5 years. In 2013, I also became the State Representative for WI for the United States Association of Reptile Keepers (U.S.A.R.K.). Through MAHS and USARK, I have been incredibly involved in legislation regarding reptiles at the municipal, county, and state level, as well as helping USARK where I can at the national level. While dealing with legislation is often tiring, it’s an incredible part of continuing to be able to keep these animals in the future. I refuse to let my kids grow up and not be able to explore their passion for animals first hand, and no other keeper should want to allow that either. Also in 2013, I, along with other MAHS members, had the amazing opportunity to work with the Wisconsin DNR, and USGS Wildlife Health Services in finding and collecting scale samples from Timber Rattlesnakes to test for Snake Fungal Disease. That was an amazing experience for everyone involved and definitely pumped people up to help save these awesome snakes. In 2014 we worked again with the WDNR, and a local herpetologist to track Tiger Salamander Spring Migration. MAHS members and I spent many nights out in the cold walking roads around a pond to find, take measurements, and track these salamanders as they moved from their dens into the water to breed. This year, MAHS is hosting the 30th Midwest Herpetological Symposium and I can’t wait to meet all of the amazing speakers and people that come out. I really love seeing the reptile hobbyists get together in person to share their passion and knowledge. There is nothing like it and it’s a feeling and experience you will never get from a forum or group online. Lastly, I’m an avid field herper and love to get out as much as I can. Finding reptiles and amphibians in their native habitat is incredible to me and always fuels my love of the animals and passion, to not only conserve them and their habitat, but to spread that message to as many people as I can. TRR: Last spring, you electrified the herping community with a $25,000 donation to USARK. What motivated that kind of generosity? Ryan: The mission and goals of USARK are something that I hold close to my heart. Saving our ability to keep reptiles and amphibians in captivity is something we should all continue to fight and focus on. Right now, USARK is the best, and really only, organization to get behind on a national level, and I fully support Phil Goss and Richard Stanley, and all of the time and they put in to save our hobby. I can’t see being a part of a company that focuses on the reptile community without helping to secure that future of reptile keeping, and that’s what started the conversation. Initially we had discussed a large donation, but hadn’t figured out how much, and when to do it. Once the Reticulated Pythons and other Anacondas were added to the Lacey Act by US Fish and Wildlife Services, I knew that day, that we needed to do something big and soon. After a short and very charged meeting, we decided upon doing $25,000 and doing it at NARBC Tinley Park during the auction. I never thought that night would end up like it did. I was a bit nervous, but really just excited as I sat there waiting to go up and speak. The auction started off a little slower than usual, with bids not quite going as high as I expected. Then the big moment came. I got to speak and stressed that while so many people, especially in that room, donate to USARK at auctions, we need to keep doing it after the bad news hits us. Every time there is something to go up against, we band together and as a community, have done incredible things. But when it gets quiet, so do we. We need to keep that passion and that energy and push with USARK constantly. Even if you can’t donate $1,000, or $100, that’s fine, most of us can’t. My wife and I are signed up on autopay for a monthly donation, and I really think everyone should be. Even if it’s just $5 a month, that’s a HUGE amount when stretched across all of the keepers in the US. After I finished talking I presented the check to Phil, and the room exploded with applause and excitement. People were fired up, and the entire feeling in the room changed. The bidding sky rocketed, more large donations came in, and even at the end of the auction, people were throwing every last dollar they had in boxes to chip in. It was incredible. At the end of the night, the auction raised nearly $115,000. More than double the next best auction to date. While I love that I was in a position to make that happen, the real thing that stuck out to me that night, was the energy in the room, and the ripple effect that donation had that night. It was incredible and I’ll never forget it. Since then, we’ve donated over $10,000 in products to auctions across the US, and will continue to support USARK into the future as much as we can. TRR: It looks as if Zilla is prospering and growing steadily. What challenges have you had to overcome to reach this level of success? Ryan: In the past, Zilla has been a company that hasn’t really connected with its consumers and has gotten the label of being a starter-kit company. This is something I immediately focused on changing. I have spent the year going out to as many large reptile shows as I can and meeting the people that use our products, as well as talk to some that don’t. It’s really helped us to see where our strengths and weaknesses are, and better target where to focus our energy as we move forward. The grass roots efforts to really get out and get people behind us has been very successful, and most importantly, a lot of fun. There is nothing I’d rather do than be at a show talking with someone about reptiles and husbandry, and sharing that passion. This is something we’re continuing to do, so the next time you’re at a reptile show, stop by and say hi! TRR: Do you have any advice for reptile lovers out there who dream of making a living in this industry? Ryan: Don’t forget your passion for the animals. That is key. Too many people focus on the money and trying to become a millionaire overnight, but that’s not how it works. The big breeders you see out there don’t make nearly what you think, and they worked their entire life to get there. Thinking you can buy a few snakes and be at that level in a year is crazy. Plus, one thing you’ll still see with all of them is they don’t see their animals as just money, they really still just love the animals. Even if you’re not looking to breed and make a living that way, your passion and knowledge are what will get you to where you want to go. So stay passionate, continue to read and educate yourself, and always keep pushing towards your goals. TRR: Do you have any future plans or goals for Zilla that you’d like to share? Ryan: In the next 3-5 years, Zilla will grow and become a completely different company. I’m excited to be a part of this journey and I hope everyone enjoys seeing the new products and innovation we come out with. Our focus is and will always be on providing the best products for you and your pets. As we grow, we will continue to find ways to give back to the community, look for ways to help with conservation, and keep reptiles and their health in home and in the wild a major staple in everything we do. TRR: Any words of wisdom for the general herping community? Ryan: Get up, Get out, and Get involved! As a community we’ve really moved toward this digital reality of social media and the internet. While this provides us with some amazing opportunities for networking and getting information, don’t forget about the personal relationships we all have and what’s happening in the world around you. Don’t forget where your passion started. While the next ball python morph is amazing, also be aware of the conservation and native species around you. Get involved with local herpetological societies, go to meetings, learn from people with decades of experience, and build those friendships and personal relationships. Twenty years ago, that’s how it was. Everyone worked together, supported each other, and it was about the animals and our future as a hobby. You can’t stop legislation by complaining about it online, you can’t save a species with online petitions, and you can’t always rely on care sheets to help you to care for your animal in the best way possible. All of these things can be solved with personal, face to face relationships, and that all starts when we meet locally and work together as a whole. So find your local reptile group, and go to a meeting. Get involved and always stay excited about these awesome creatures. TRR: Is there anything else you’d like to share with the TRR readers? Ryan: My life has had its ups and downs. I’ve worked hard to fight for my hobby and fight for everyone around me that shares that hobby and passion with me. Now I have the opportunity to take a company and focus it, not only on habitats and products, but on giving back and fighting alongside everyone in our community to keep this hobby around for a long time. We’ve been able to support local rescues, conservation projects, and herp societies across the US, and we will continue to do whatever we can to help our fellow herp lovers wherever we can. The more support we get from our community, the more we are able to give back. I’m excited to see where the next few years takes Zilla, and look forward to hearing your thoughts and meeting people at every show we attend. Thank you all for your support! And thank you, Ryan, for all you do! I can’t wait to see you at the next reptile show!